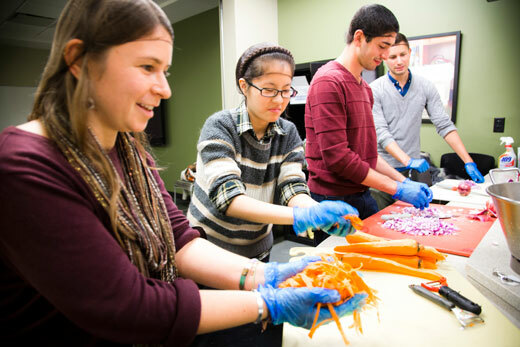 Led by founder Naomi Maisel (left), student volunteers with Emory’s Campus Kitchen use recovered food to prepare meals that will be delivered to community groups fighting hunger. Emory Photo/Video. Armed with a commercial freezer, a group of dedicated student volunteers, and the support of a successful nonprofit organization, Naomi Maisel is ready to tackle a problem she has wanted to solve since her freshman year at Emory. Now a junior human health and anthropology major, Maisel is student president of the new Emory chapter of the Campus Kitchens Project (CKP), a Washington, D.C.-based community service program that helps students recover food from university dining venues that otherwise would be wasted to prepare and deliver meals to community organizations fighting hunger. After nearly two years of planning, the Campus Kitchen at Emory University has begun preparing meals to benefit local charities including Mercy Community Church, Intown Collaborative Ministries, Atlanta Day Shelter for Women and Children, and Meals On Wheels Atlanta, with other partnerships pending. It all started when Maisel was clearing her dishes after eating at Dobbs Market. "There was this large trashcan and it was filled to the brim with uneaten food," she says. "It bothered me so much, I left thinking about it." The next day, she headed to eateries on and around campus to see if they would donate unused food that otherwise would be thrown away. "Everyone said yes, but they told me I needed to be a 501(c)(3) nonprofit for them to donate to me," Maisel says. At the direction of helpful restaurant managers, she went to Emory Campus Dining Services and met with senior director David Furhman. Furhman oversees the campus dining program and the work of Sodexo, a company which partners with CKP in the fight to end hunger, especially through the efforts of the Sodexo Foundation. Fuhrman, who had only been on the job for a few months, came to Emory from Johns Hopkins University, where he'd helped start a Campus Kitchens chapter. He told Maisel about the organization and encouraged her to contact CKP's headquarters. "It is an amazing organization and they do great work. Having Naomi start a chapter here allows us to really bring to life many of the values that we have in Campus Life and at Emory," Furhman says. "Instilling a sense of responsibility and core values among our students is central to our work, and we talk about the importance of cultural humility, leadership, health and wellness, diversity and inclusion — all key concepts that make us who we are at Emory." Campus Kitchens "is perfect in so many ways," Furhman continues. "First among those is it is simply the right thing to do. The fact that we have food on this campus that goes to waste every day is a tragedy," he says. "To be able to repurpose perfectly good food in a way that puts that food on the plates of the people in our community and in the Atlanta community who need it most not only makes sense, but it is our responsibility." Maisel did some online research and contacted Matt Schnarr, expansion and partnerships manager with CKP in Washington. "They sent a planner to meet with me and there were just so many things to do," says Maisel. She spent the remainder of her freshman and sophomore years working with Dining Services, Sodexo, the Office of Student Leadership and Service (OSLS), and CKP planning, organizing, and taking care of all of the legal and institutional formalities required to form Emory's chapter. With help from Emory's administration, she located a space for the group to prepare meals and secured an industrial freezer to store food collected from dining services around campus. By the end of the 2013–2014 academic year, she had organized a large group of like-minded students willing to be charter members of the group, spent two months getting everyone state-certified to handle and prepare food, and planned a pilot of the program held during spring semester. "At first we just collected bread products from Dobbs Market and Cox Hall Market on Tuesdays and Fridays and took them to the kitchen for packaging, labeling and dating to put in our freezer," Maisel says. "We filled the freezer completely after only two days collecting from two locations on campus. It was overwhelming. I didn't realize how much food waste was generated, but it helped us recognize how much we needed to be able to handle in terms of volume." With an executive board of 10 students — all handpicked by Maisel to ensure dedication and sustainability of the chapter — the Campus Kitchen at Emory launched in November. "We have a core group of volunteers who are each in charge of helping to plan and running the chapter and that will be supported by Volunteer Emory with people who want to come help out either one time or on a weekly basis," Maisel says. The group picks up food from Cox Hall Market, Dobbs Market and other campus eateries and takes it to the preparation area in the demonstration kitchen located in the basement of Few Hall. Food collected includes prepared breads and unprepared fruits, vegetables and other foods from catered campus events. The group has a scale in the packaging room they plan to use to track the amount of food collected and the amount of prepared food donated to the community. Once per week, students repurpose the food into prepared meals using recipes provided by Campus Kitchens and freeze them for distribution to community organizations. Volunteers can sign up for food recovery, preparation and delivery shifts. Furhman says it is gratifying to see Maisel and other students "living what they learn" at Emory. "I really am so proud of Naomi. She has worked tirelessly for more than year to bring this to life here," he says. "It all goes back to the Campus Life Division and the theme of 'embrace your passion, unleash your potential.' It is our job to support what we are trying to instill in our students — concepts like social justice, cultural humility, sustainable and healthy environments — and what Naomi and these students are doing embodies all of that and brings it to life in a really meaningful way." Maisel's work is already drawing attention from leaders across the university. In October, she was honored with a Sustainability Innovator award from the Office of Sustainability Initiatives. She was also featured by the Division of Campus Life as an example of a student whose Emory education is a "catalyst" — compelling her to "significant action." Catalyze is one of the key concepts from Campus Life's mission and vision statements, and Maisel was named "Dean's Definer of the Month" for October. Robert A. Stern, chair of the Sodexo Foundation, says the organization supports the mission of student-focused hunger organizations like the Campus Kitchens Project on its partner campuses and is committed to helping develop the next generation of anti-hunger leaders. "There are nearly 184,000 people living in Fulton County who are at risk of hunger, of which more than 52,200 are children," Stern says. "With a need this considerable right in Emory University's backyard, collaborative efforts like the Campus Kitchens Project that engage students and the campus community are vitally important. " An administrative board made up of members from Campus Dining, Sodexo, the Office of Sustainability, OSLS, Emory's Interfraternity Council, Campus Life and Emory Catering will help ensure that the program continues after Maisel graduates in 2016, something that is important to her. "It is an incredible feeling because it was just an idea and it is amazing to see that really blossom," she says. "The great thing about Campus Kitchens is that everyone involved has a stake in it because it is your university, your friends, your administration, your community. This is something I want to continue for years after I am gone."